A showcase of gear highlights seen at the 2017 OutDoor show in Germany, most of which will not be out until 2018. 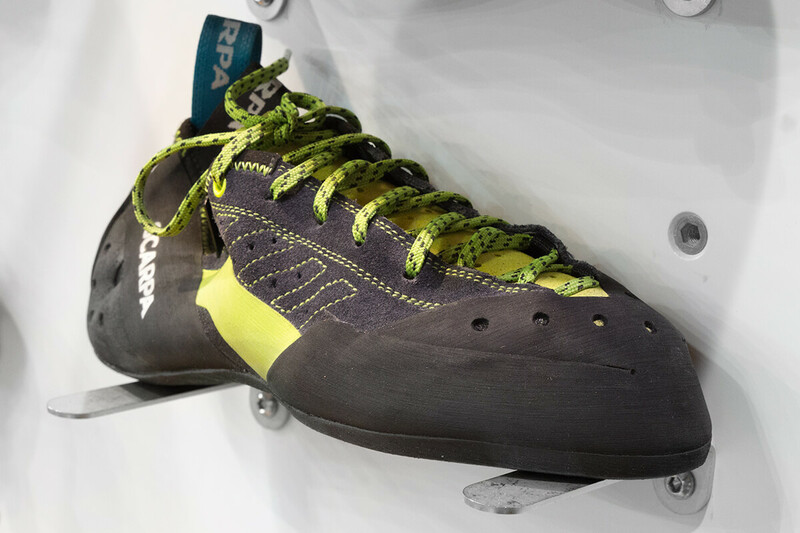 This round-up includes a select group of the most innovative and interesting climbing products we saw over 4 days at the show. All the photos below were taken at the OutDoor show by Andreas. Primarily targeted for rescue, the Escaper will allow you to rappel a full rope length with a single rope and retrieve your rope after the rappel. The Escaper kit comes with a pre-sewn Dyneema wrapping system and a short strand of rope. To use, thread the provided rope through the rappel anchor and then into/through the Dyneema wrap. When you rappel and keep the rope tensioned, the escaper acts as a prusik and holds the rope securely. When you are secured at the next belay station, tug the rope 8+ times and the Dyneema wrap will slowly work its way down the rope which eventually pulls through the Dyneema wrap completely and through the anchor. Example rescue scenario: You’re using half ropes on a route that requires full length rappels and one rope becomes compromised. You can pair the good half rope and the Escaper to complete a full length rappel. We heard about Black Diamond’s new shoe line from the two main guys on the project: Linh Nguyen and Kasey Jarvis. Linh has an extensive background of working with shoes since the 90’s when he was at Boreal and later at Evolv. Kasey worked for Nike for 7 years as a shoe designer in Nike’s innovation lab. Why shoes? Black Diamond wanted to finish out their climbing range and also felt that they could bring a unique offering based on their engineering knowhow. This can be seen in shoe features like their injection molded midsoles and laminated features. The team also took a page from Nike’s playbook using knit uppers that are more breathable, combining 2 blended layers of polypropylene and polyester for the entry-level models. They’ve also created their own sole rubber called Neofriction that they manufacturer at their partner factory to ensure they control the consistency and process. The Momentum is coming out in July, 2017 at MEC and in October at REI, with a global launch January, 2018. The rest of the shoe models are expected to be released in 2018. Looking to add it’s name to the “Lightest Harness” list, Blue Ice is coming out with the Choucas Light, which will be one of the top 3 lightest harnesses on the market. With this debut they’ve even won an Outdoor Industry Award that praised its functionality, material choice, design and weight/pack size. The Chocas Light saves weight thanks to the Dyneema body and lack of traditional metal buckles. We won’t call it comfortable to hang in, but that’s not the goal; instead it excels in cutting grams and creating a packable product that will excel in ski mountaineering and ultralight alpine ascents. 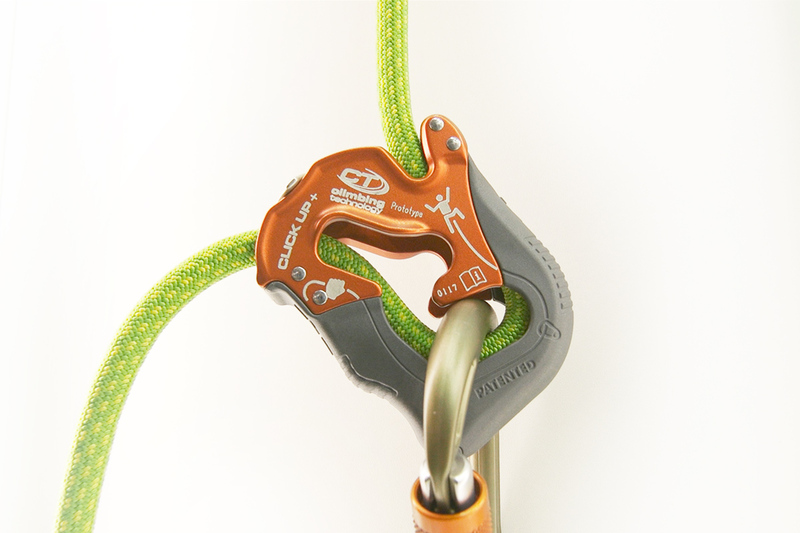 Key features and updates include: less metal and more plastic to reduce the weight, redesigned shape to improve the feel in the hand, a wider range of ropes (8.5 mm – 11 mm), and the “V-proof system.” The V-proof system helps to activate the braking system even when a belayer has their break hand above the belay device (which would typically make it difficult for the device to lock up as the ropes would become parallel). The original Swift 8.9mm Dry rope, triple certified as a single, half, and twin is one of the lighter triple rated ropes on the market and one of Edelrid’s most premium ropes. It’s reputed for its fantastic handling and durability characteristics. With the Eco Dry version of the Swift, Edelrid has upped their game in sustainability goals to create the first ever PFC-free rope that meets the UIAA Water Repellent standard. It’s also bluesign® certified (like all Edelrid’s ropes). It will come in one color option with a painted middle mark and 60m and 70m options. Not a new climbing product itself, but a totally new concept that impacts the experience of using new climbing ropes. 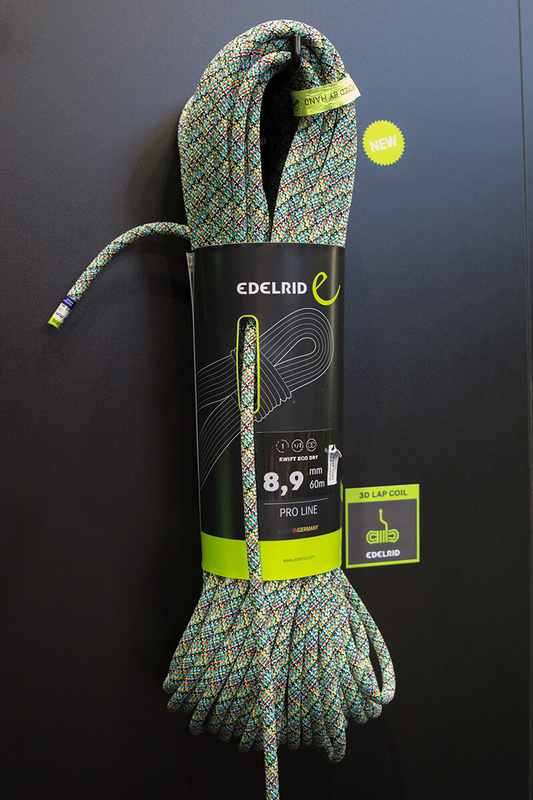 Edelrid’s 3D Lap Coiling machine ensures you could belay literally straight from the package without twists. Inspired while playing with Legos with his son, Daniel Gebel envisioned the concept of 3D coiling. A college intern and in-house mechanical skills helped create the final concept. 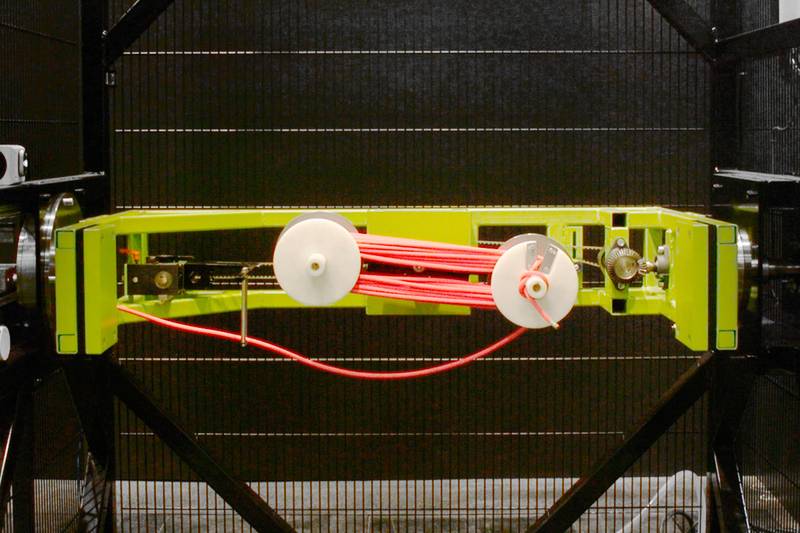 Previously, to attain the same type of coil it took expensive robots with an articulating arm, or special unraveling techniques. Starting in August 2017, all Edelrid ropes will be coiled using this (patented) method. The first generation Smart was launched in 2009 and it’s getting updated for 2018. The main change is an improvement to the braking effectiveness, it brakes a lot faster and completely blocks the rope. This also means if you’re climber is resting you no longer have the weight of the climber on the braking hand as the device has it under control. Mammut also expects improved ergonomics with a soft, two component grip. The Smart 2.0 also has an optional add-on component called the Smarter (sold separately for €19). The Smarter is geared towards newer climbers who have not honed their belaying practices perfectly. 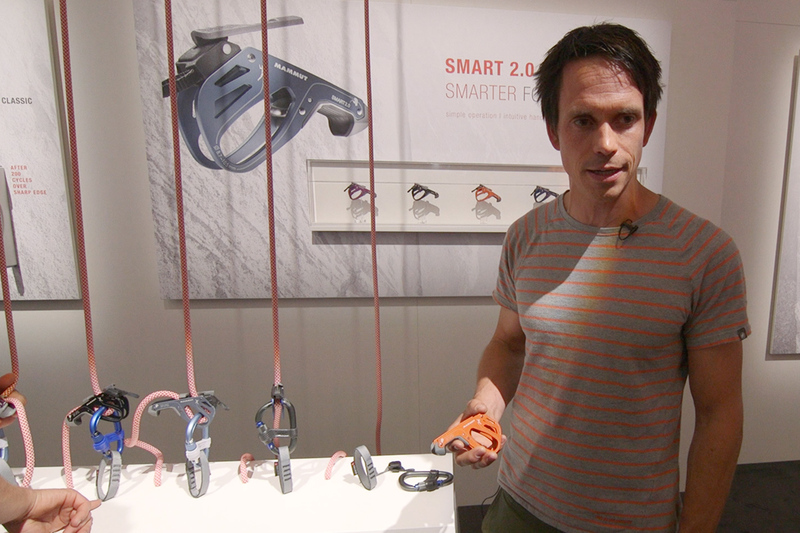 The Smarter adds a piece of plastic between the climber side of the rope and the break side. The gap between the rope helps the Smart 2.0 engage in case of a fall while the belayer has their break hand above the device. Scarpa is bringing out lots of new shoes this year (6 models total), but what really caught our eye is the Maestro Mid, which will come in a men’s AND a women’s version which is shaped on a narrower last. Finally there looks to be a really well-thought out response to the TC Pro. Worth noting: Scarpa is also releasing a version of this shoe called the Maestro, which is the exact same construction as the Maestro Mid but with a lower cuff. Wild Country debuts 2 models of shoes, the Mashuga and Patheon. These shoes are made in conjunction with the Michelin® Moto G team to create a rubber compound which took nearly 2 years of refinement. Michelin® engineers compared all the rubbers on the market and worked to create a delicate balance of grip, edging properties, and durability. The shoe uppers also look quite different; they have a 2 layer microfiber construction with a PU layer sandwiched between creating an internal skeletal system (nearly all other climbing shoes use an external system made of rubber that is 3x-10x the thickness of this PU). By using this construction Wild Country significantly decreases the weight of the shoe, as PU is far lighter than rubber for the same strength. 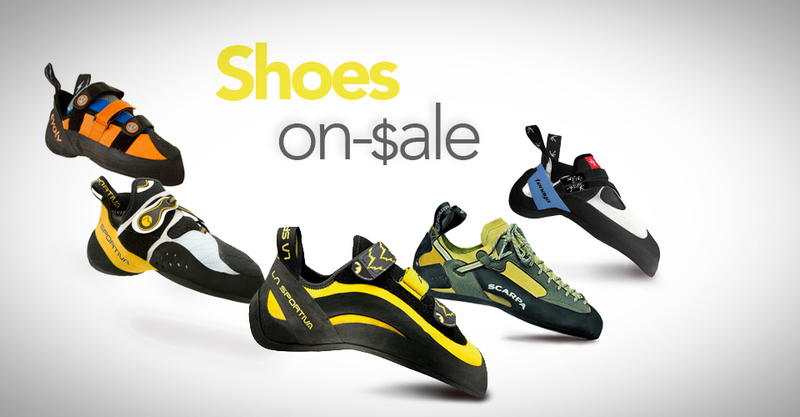 Mashuga is more of a sport climbing and bouldering shoe, it has velcro straps with a moderate downturn and slightly asymmetric shape with more tension in the heel and a higher toebox for curled toes. No midsole, but has an overknit fabric that wraps under the foot so the cloth compacts on the foot while the toe is weighted, so it relies on the foot for the tension vs the midsole. Patheon is a crack climbing shoe that has laces, is straight (not asymmetric), slim and low profile, allowing for precise footwork on small holds and pockets. This was the first time that we went to the OutDoor trade show in Germany. We were amazed at how much bigger the show is compared to the US Outdoor Retailer show. We spent a majority of our time connecting with brands we weren’t as familiar with, like the Spanish rock shoe company Garra and the French shoe company Andrea Boldrini. There were many more innovations at the show, many of which lie just out of our range of coverage. Some other climbing related products that are worth a curious glance are: Skylotec’s via feratta set the Rider 3.0, DMM’s RFID tracker set iD, and Edelrid’s Topper Station Refit. We’ll get to more gear updates such as Petzl’s upgraded helmet and harness, more new shoes from Scarpa and La Sportiva, and many more pieces of gear after the US Outdoor Retailer trade show. I’m super excited about both versions of the Maestro. . . if they climb anywhere near as well as the TC Pro, but come in actual man sizes (14 street shoe here). Any word on how they fit and climb compared to the almighty TC Pro? Yes, I am particularly curious about these myself! 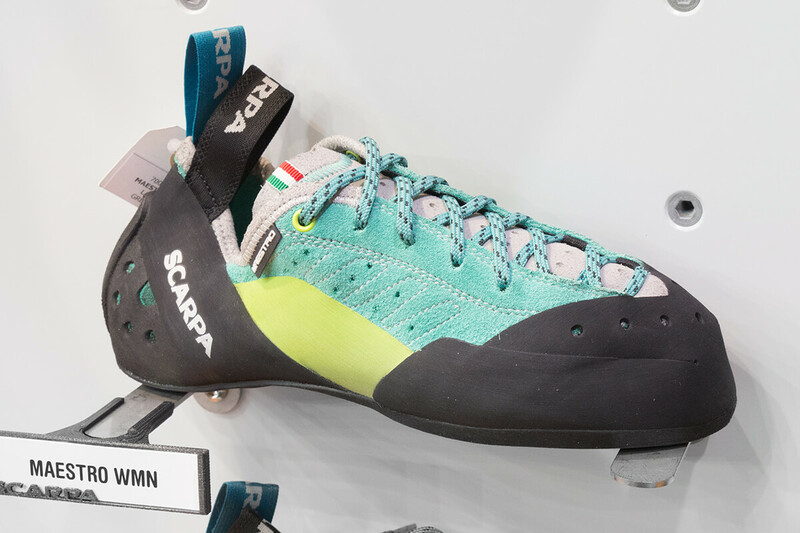 My understanding is that they’ll be available in “actual man sizes” up to US 15 (for SCARPA, that’s Euro 49)! I will see what info I can dig up in terms of comparison to the TC Pro.